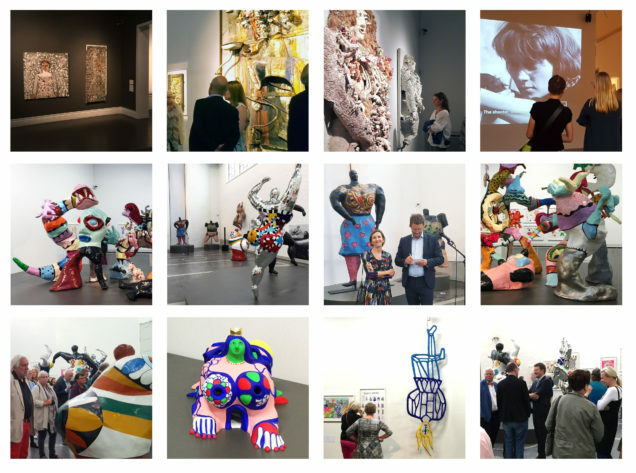 The first major Niki de Saint Phalle’s exhibition started on Saturday, August 20th, at Taidehalli in Helsinki. With the exception of an exhibition at the Galerie Forsblom in 1984, Niki de Saint Phalle has never been presented to the Finnish art public. With more than sixty art works on display, including paintings, figurative assemblages, graphics, Nanas, sculptures and models of dreamy architectural projects, this new exhibition gives the Finnish audience the opportunity to understand the extend of Niki de Saint Phalle’s energy, creativity, techniques and social commentary. 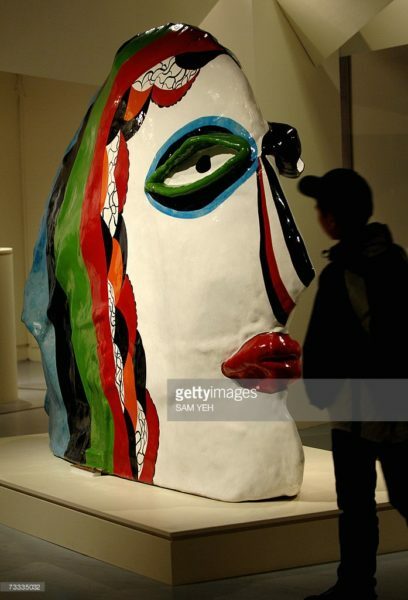 One striking example of this exhibition is the mysterious double-faced polyester sculpture, Grande Tête from 1971. This unusual piece is part of a series of large and unique artworks made at the beginning of the 70’s and titled almost the same. The name of the first one made in 1969 : Le Témoin (The Witness) leads to a peculiar interpretation of their meaning… Stoic and earless are these enormous heads silent observers? Do they stare? Do they judge? © 2016 Niki Charitable Arts Foundation. All Rights Reserved. Which version was true? All of them? None of them? Is perceiving is only personal? Does that mean my version is only mine? Where does that put reality? Does it exist? Do I exist? Is life a dream? My dream that I can choose to make a nightmare or a song? Grande Tête is a giant head divided in two sides. Its faces are decorated with her signature style : flat lines and bold colors. On one half the hair is painted in large locks of light blue, green, red and orange. The nose and the eye, which slightly blinks, are made-up with playful designs as well. On the other half the hair is wavy and grey, there is no make-up and the eye is wide open. This sculpture is a piece to be experienced. Indeed from the side, Grande Tête is large and seems voluminous and round, but from the front it reveals itself narrow, flat and almost sharp, creating a strong visual effect ! 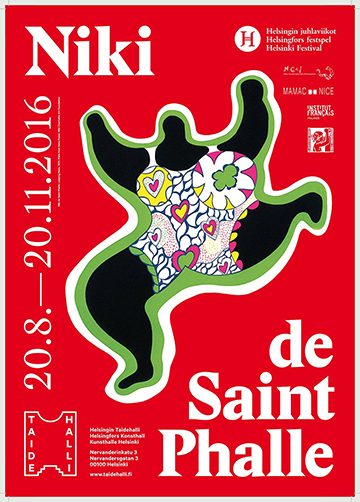 Other major artworks featured at Taidehalli are Niki de Saint Phalle’s infamous Autoportrait (1958-1959), a black Nana Lady Sings The Blues (1965), an homage to R&B legend Billie Holiday, and Le Pendu or The Hanged Man (1988) from the Tarot Garden series. We hope you visit Niki at Taidehalli before November, 20th 2016 and share your thoughts and pictures online ! We would like to thank the Taidehalli Museum staff and guests, curators Camille Morineau and Satu Metsola as well as MAMAC Nice, Galerie GP&N Vallois and private lenders for their generous help in organizing this beautiful exhibition.